In the medieval period preparations with hallucinogenic herbs were part of the practice of veneficium, or poison magic. This collection of magical arts used poisons, herbs, and rituals to bewitch, heal, prophesy, infect, and murder. In the form of psyche-magical ointments, poison magic could trigger powerful hallucinations and surrealistic dreams that enabled direct experience of the Divine. Smeared on the skin, these entheogenic ointments were said to enable witches to commune with various local goddesses, bastardized by the Church as trips to the Sabbat--clandestine meetings with Satan to learn magic and participate in demonic orgies. Examining trial records and the pharmacopoeia of witches, alchemists, folk healers, and heretics of the 15th century, Thomas Hatsis details how a range of ideas from folk drugs to ecclesiastical fears over medicine women merged to form the classical “witch” stereotype and what history has called the “witches’ ointment.” He shares dozens of psychoactive formulas and recipes gleaned from rare manuscripts from university collections from all over the world as well as the practices and magical incantations necessary for their preparation. He explores the connections between witches’ ointments and spells for shape shifting, spirit travel, and bewitching magic. He examines the practices of some Renaissance magicians, who inhaled powerful drugs to communicate with spirits, and of Italian folk-witches, such as Matteuccia di Francisco, who used hallucinogenic drugs in her love potions and herbal preparations, and Finicella, who used drug ointments to imagine herself transformed into a cat. 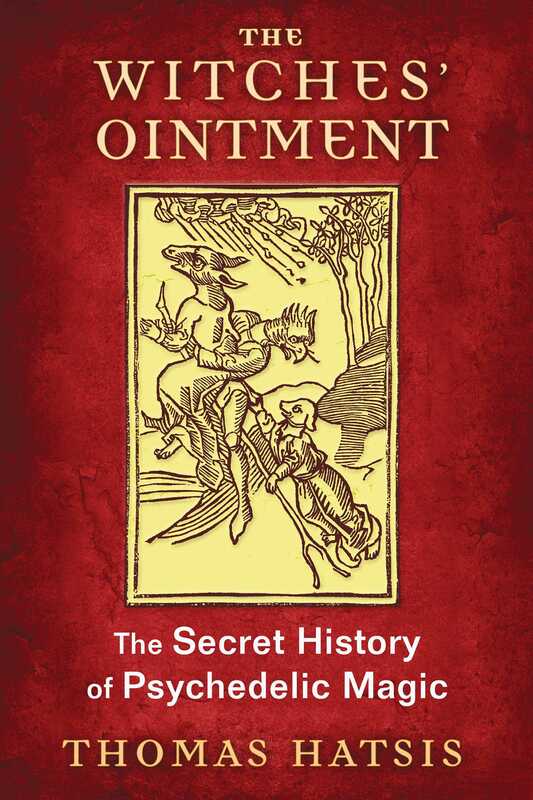 Exploring the untold history of the witches’ ointment and medieval hallucinogen use, Hatsis reveals how the Church transformed folk drug practices, specifically entheogenic ones, into satanic experiences. A woman, alone at night, pulls a small ointment jar from a chest hidden beneath her bed. Opening the container, she scoops a handful of the foul-smelling goop--the witches’ ointment (lamiarum unguentum)-- into her palm. She turns to an ordinary broom in the corner, the kind her neighbors foolishly believe has no further use than sweeping or maybe killing a mouse; at present, this woman intends to do neither. Grasping the besom from the shadows, she smears the long, wooden handle with her witches’ ointment; straddling the oily broom, she is instantly lifted into the ether. Out the window to join scores of women who have similarly anointed implements, she soars aside demons that fill out the entourage. As they glide over rooftops and clouds, dotting the moon in their wake, all are careful not to mention the name of God or Christ, lest they plunge to their death. They are traveling to a faraway meadow--leagues beyond the watchful eyes of the clergy and their neighbors--where they will join others already assembled, reveling and worshipping Satan: the Sabbat. Should any newcomer wish to join Satan’s congregation, she must pay homage to him by renouncing her Christian faith and trampling upon a large cross conveniently placed before her feet. Finally, she must solidify her devotion by planting the obscene kiss (osculum infame) on the Devil’s derriere. Now a full member of the sect, she will join the others in a fine banquet of murdered children. They will feast heartily only to discover that the food lacks all taste, and oddly leaves the diners still hungry. Afterward, she would engage in such wicked debauches as dancing backward and fornicating with demons. Satan had conspired to rule the world and conscripted gullible witches to help carry out his nefarious plans. He would eventually send his flock away, but not before instructing them in the malefic arts (maleficium, or “evil magic”), which included preparing ointments and potions from the remains of dead children. These mixes were used to inflict harm or death upon the populace, raise storms and disease, and stir hatred between pious Christians. The above, more or less, is what demonologists believed witches practiced during the Burning Times (ca. 1550-1650), when tens of thousands of women and men burned for their supposed diabolic crimes. The Sabbat itself was a composite idea, fueled by the literate class’s appropriation and redefinitions of numerous templates. Indeed, all of these acts associated with the Sabbat--night-flying, demonic congregation, Satan worship, wild orgies, cannibalism, and celestial insurgency--were quite separate ideas once, deriving from folklore, ecclesiastical ideas regarding heresy, common ideas about magic, and demonology that had been developing over the preceding centuries. Scholars largely agree that the Sabbat first appeared in Europe within the texts of ecclesiastics writing between the years 1430-1450. These components were tampered with and eventually amalgamated into the diabolical witch, preforming her maleficia, within the larger witch cult. One of these offenses, though, was a newcomer to the stereotype of the witch. While all those other ideas evolved over the eleventh to the fifteenth centuries, the notion of an ointment used to fly through the air only started appearing in records around the early fifteenth century, at the cusp of the theological formation of the witch stereotype. “Witches’ ointments” were magical drug (veneficium) pastes, ointments, and oils that women and men were said to smear over their bodies; those anointed would then fall into a deep sleep (soporatum), experience fantastic visions, and upon waking claim to have traveled great distances and copulated with others. Contemporary reports have led some modern scholars to theorize that the so-called witches’ ointments contained soporific, hallucinogenic, or otherwise psychotropic ingredients mostly culled from the Solanaceae family of plants and that the effects of these drugs were the cause of such bizarre delusions. This theory is not without evidence; most historians of medieval European magic agree that several kinds of medical folk magic existed and were practiced by low-strata women and men. There is little doubt that this folk magic involved the use of plants and herbs in remedies and potions. Mostly when ointments and potions are mentioned in trial records, they are used to heal; cause insanity; incite love, harm, or death in people; and/or cause harm and death to animals. This theory is rejected by others who believe that the ointments were a “product of either harmless folklore or demonological theory . . . not effective mind-altering substances.” However, there is previously overlooked evidence indicating that the witches’ ointment, like other aspects of the witch stereotype, had a foundation in real folk sorcery intentional drug use. Although trial dossiers are terse on the modes of folk magic, we can nonetheless get a taste of local magic by the practices that inquisitors and others of the literate class documented. Some of these arts involved weather magic, lot casting, invocation, image magic, medical magic, murder through magical means, poison magic, and love magic. . . . Other forms of veneficium specifically dealt with ingesting poisons and elixirs of various types, the contents of which comprise the present study. This book is the story of how veneficium got swept into the witch stereotype and became a tool of diabolical witchcraft in the opinions of the authorities. It is the story of an early medieval canonical belief, outlined in the famous canon Episcopi. It is the story of how the canon’s original condemnation of a specific folk belief--that of night riding with ancient goddesses--was reinterpreted by theologians centuries later to prove that witches really did exist. It is the story of folk magic and the knowledge of poisons some people used to practice those arts. Finally, it is the story of how, within this theological redefinition of the witch in the early fifteenth century, the “witches’ ointment” was used to explain how witches flew to the Sabbat. This book is fascinating and reads like a well-written novel. But it is not a novel; it is a meticulously researched history, based on primary sources that were not easy to find. It is the beautiful fruit of a long, arduous scientific investigation that is presented in a light, easily readable style.